Shakespeare’s final play tells the tale of the powerful, vengeful wizard Prospero, and of how he wove the fortunes of young lovers, old enemies, drunken fools and a bitter monster. The Tempest was performed in the Dylan Thomas Theatre, where Shoreline Theatre conjured a besieged ship and a magical island. 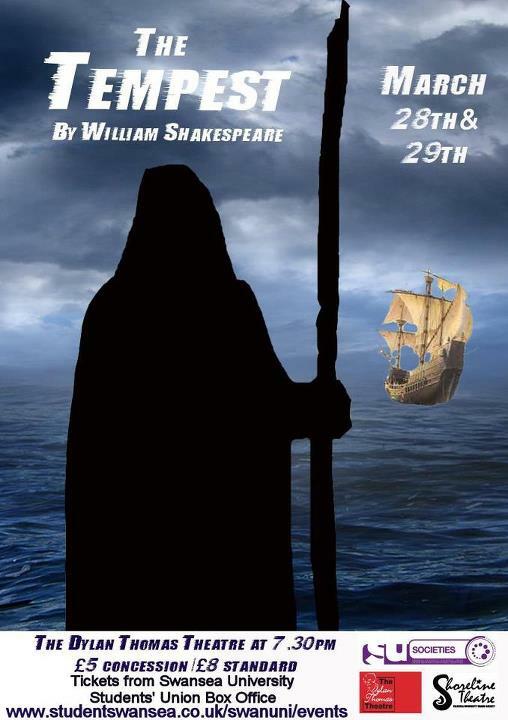 The Tempest takes place on an exotic island where Prospero has been exiled with his only daughter, Miranda. When Prospero’s enemies’ ship come near to the island, he uses his magical art to bring them ashore and plan his revenge. It was directed by Steven Hirst and Dominic Padfield, and performed on Wednesday 28th March and Thursday 29th March in 2012 in the Dylan Thomas Theatre.